4 Don't know any of them. 5 I am not familiar with any of the above men. 27 A true, experienced labor leader. Non-player! 62 David Cornwell or possibly Joe Spagnola. 66 A serious and vetted executive with no NFL ties. 70 brent boyd if he's crazy enough to do it! 2 They need to CLEAN HOUSE and name NEW blood. 3 Three independent doctors should be on the board. 8 ONE FROM THE 50S, ONE FROM THE 60S AND ONE FROM THE 70S!!! 9 The old way didn't work. 18 The tradition between Garvey and Upshaw is to ingrained to continue productively. A new approach throughout the entire organization is neccesary and prudent. 20 with out a doubt.active playersare not menbers of the plan yet. why should they even have a vote. 1 How could we have been treated fairly when we we have never been represented at the barganing table? 2 I am a wife that is a widow and think all should really think out how long their pension will last. My was one year after his death and it hurt to not have it but that was the selection he took not knowing when he would die. Get advise and help. 5 No we should be on the same page as the present day Players. 6 Gene Upshaw had absolutely no vision and didn't meet his job descrition. Bottom line is the CBA should have had accelorators built in tied to subsequent CBA's. 7 If our pensions were adequate, we wouldn't have our fallen Brothers not able to afford their own insurance and lose all the worldly possessions they have accumlated. 11 my husband was denied disability (dementia) although Soc.Sec. found him to be disabled. 13 I have heard too many stories like Vic Washington and Reggie Williams and Wesley Walker. The traditional motivation of the board has been to deny our benefits at every turn, and force us to go through the expense and stress of litigation to try and get what we deserve. 14 At present, I would like to think yes..but I don't know if I am seeing the entire picture and/or all choices!! 15 The adversarial relationship between current and former players - union leadership agenda and action - has tainted the entire process and specifically the retirement/disability issues; especially the pre 1980's when medical care from the team physicians was so owner biased. Many of the medical decisions and treatments from the pre 80's were miserably short sighted with little or no concern for the long term health of the players on the field. 17 they screwed it up. letting Upshaw con them. 11 It doesn't matter whose to blame. Fix it! 17 The NFLPA, the NFL, and all of us share blame. 25 should not have director for more than four yrs. What questions would YOU ask prospective candidates if YOU were on the selection committee? 1 Are you an objective, fair, and ethical decision maker who can represent the retiree? 2 will you go back and reverse the corrupt denials of disability benefits? 4 Emphasize that all players will become retired and need to pay more attention to pension and long-term health care. Active players should contribute more to pension since their huge financial gains have been due to the contributions of us now-retired players. 5 What are you going to do to improve pensions and disability issues? 6 Would you agree to a COMPLETE audit of the retiree pension/disability books?? Would you vote in favor of retiree representation at the barganing table? 9 What experience do you have in Labor Relations and Negotiations ? 11 1. Compare the benefits received by NFL retires to the benefits received by MLB and Basketball retires. 2. What additional expertise would be beneficial to have in the leadership in the union? 3. What changes would you make to insure there is not a real or perceived conflict of interest between the union and the NFL? 4. How would you hold the leadership accountable? independent audits, detailed financial reports, etc? 6. Describe how you can facilitate the changes needed in this organization. 13 Why are widows who are receiving a benefit not allowed to keep what their husbands work for and would have wanted for their spouses be taken away if they do something honorable like getting married? 14 Are you a realist or a glory hound? Do you believe in concusion damage? Are you really your brothers' keeper? Do you realize that those that came before you were the guys that helped build the NFL to what it is today? 15 What is your agenda for retired players? 17 Do you work for us as you do for the present day players? 18 what will you do to help the retired players lack of benefits and how soon would this happen? 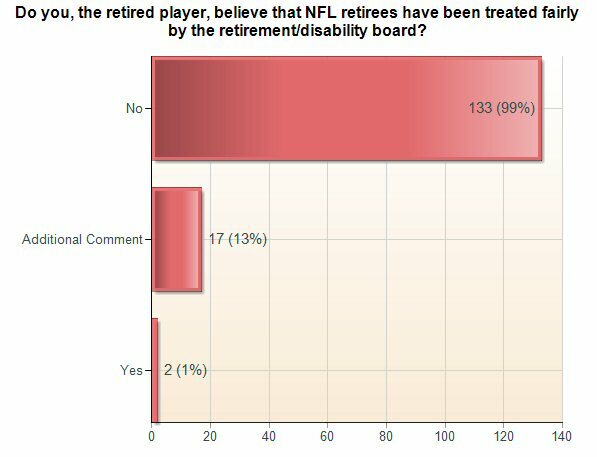 19 Are you in favor of allowing a retired representative on the NFLPA board? 20 Do you think the vesting requirement is fair and if not, what would be the new requirement? 21 GET THE MESSAGE TO THE ACTIVE PLAYER THAT THEY BETTER LOOK INTO THE FUTURE WHEN THEY WILL BECOME ONE ON THE MASS OF RETIRED PLAYERS THEMSELVES. GET OFF THEIR ASSES WHEN IT COUNTS! 23 How serious are you about making some real changes regarding pension and disability? 24 what are you going to do about the inadequacy of the pension plan as it relates to MLB andNBA standards? And what are you going todo about disability for retired players over 55 who have not applied for SOCIAL SECURITY disablity before they were 55? 25 What are you going to do to improve pension, disability and healthcare benefits for retired Players. 26 Just bringing NFL retirement standards up to MLB would be a positive step. Do you feel NFL players deserve less than MLB players? Why? 27 Describe their understanding of the four primary issues facing retired players, prioritize them and offer their vision of how we can improve this situation. 28 DO YOU BELIEVE WE SHOULD BE TREATED AS FAIRLY AS BASEBALL!! 30 Give me a list of what your top goals would be for the Past, Present and Future players. 31 what will you do to make certain older retirees (pre 1996) are afforded some monies for health insurance, as are those after '96? 32 Do you or have you had any close relationships(business/personal/social)with any team of the NFL, media or NFL ownership? 33 Do you believe there is long-term damage caused by concussions? will you act to repair false disability claims denials? why can't we have MLB -like benefits? WILL YOU STOP ACTING LIKE THERE IS A WAR BETWEEN ACTIVE AND RETIRED PLAYERS? will you appoint a retiree as a voting member of NFLPA Board? 34 will you correct the disability nightmare, and get rid of the 3 "player reps" on the voting board? will you improve pensions and include COLA? will you appoint a retired player as an equal voting member of NFLPA board of directors? will you demand a GAO audit? 35 What can you do for us with retirement and access to affordable health insurance? 36 will you allow retird players an active, equal, voting rep in the NFLPA? will you demand an audit? what is your experience in negotiating major contracts, like a CBA? 37 What is your experience in labor negotiations? Which workers have you represented in the past? 38 How would you correct the Pension Plan? Is it important to give retired players a voice? If so how would you accomplish? Would you favor a rookie pay scale and why? 39 what is your view on increasing pensions for retired players? 40 Do you intend to represent retiree's rights as vigorously as those of players? 41 WHAT IS YOUR CURRENT OCCUPATION? 44 Are you open to honest discussions regarding retired players pension and disability issues. 46 will you stand your ground against the owners or be another Upshaw-will you have integrity, and what experience do you have that qualifies you to negotiate CBA's and will you help retirees? 47 how quickly will you act to improve the fate of retired players? 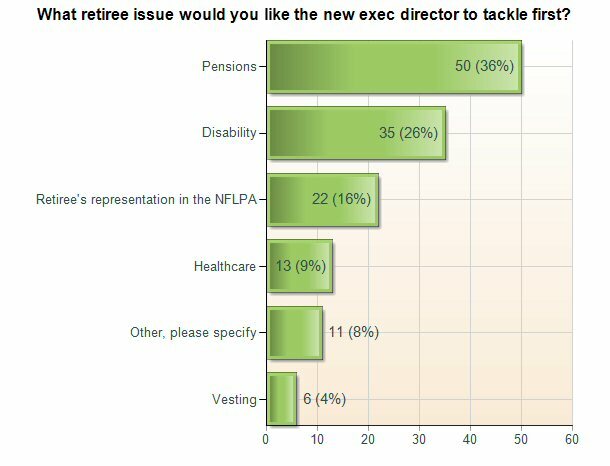 what will you do for retirees, and will you appoint a retired player full equal voting position on NFLPA board? 50 will you level the playing field and give all past players vesting rights after 3 years service? 51 will you represent retired players, or are we DOG FOOD TO YOU??? 53 will you get rid of TOM CONDON on the retirement board immediately? 54 how will you treat retired players and our issues, will we be a priority? do you have any close friendhsips with any owners, NFLPA execs, or player's agents? 55 what will you do for wives and widows- or children- of retired players who have such a short life span? 56 are you a folloer/descendant of Gene Upshaw? will you continue with Upshaw sytle mangement of NFLPA? or do you have a sense of others and humanity? 57 what will you do to cut red tape concerning retired players who file for benefits? 59 How do you convince the current players to icrease pension benefits to all the retired players. By doing so the claims for disability would decrease because they could afford health insurance. 62 What past accomplishments qualifies you for this position? 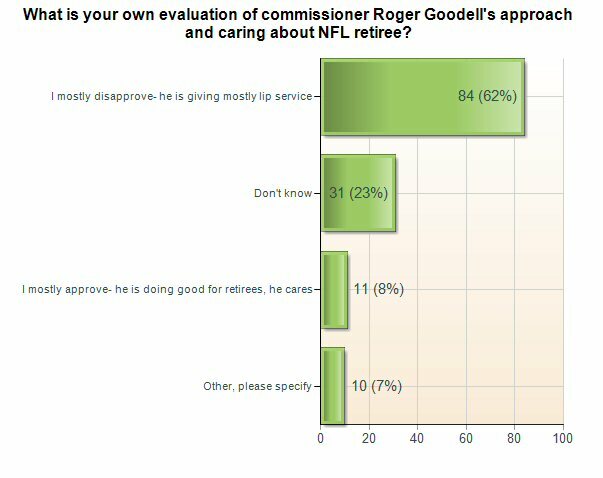 63 Will increasing retirement benefits be a priority for you since Commissioner Goodell has said it will be a priority for him? 64 What would you do if you became disabled and was no longer able to provide for your family? 66 What specific action step will you take to addrress the concerns for the retired players given the data that is now available concerning the long term impact it has on our lives? From a legal standpoint, what can immediately be done to begin addressing these concerns? Are you aware and do you care about the desperate situation of some retirees which could be alleviated somewhat by a larger pension and better health care? 69 What are you going to do to work yourself out of this job? 70 Can you get our pensions increased? Will the NFL pay for football related hospital bills? 72 what are they going to do about pension plan? 73 Who are you loyal to and how do you prove it. 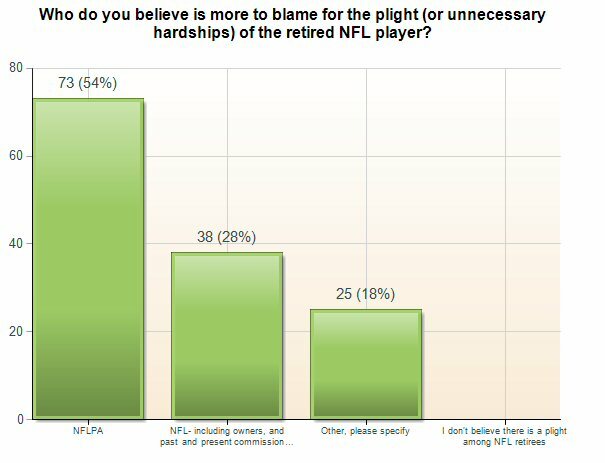 75 Given the violent and collision prone nature of professional football, and the subsequent consequence of debilitating injuries which are sometimes delayed in their manifestation, how concerned are you with NFL retirees having pension and disability benefits on par with other major sports unions like MLB and NBA? 76 do you feel you represent former as well as active players? What are your plans in regards to disability and pensions for retired players? As part of a new collective bargaining agreement will you fight for the abbove mentioned issues? 77 What plan would you implement to ensure that retired player pensions are comperable to other professional sport pension plans? 78 Who are you going to represent? Will the pre-'60 alumni get any considerations? 79 Do you favor leveling the playing field, or handicap $ to protect a player from the 50's-60's versus current players income? 81 Law degree? Masters or Phd? Pension and disability skills? Seasoned negotiator? Ethical background. Not in the NFL loop. 82 If you are the next executive for the nflpa please list your priorities of problems that need to be addressed in order and state thoroughly how you plan to get them resolved? 83 1) Which labor attorney would they hire / consult with during the strategic process of collective bargaining? 2) What do they feel would be the most productive relationship between current and former players? 3) What specific actions would they prioritize in reference to the past and current players retirement benefits? 4) Do they feel that the current players have a responsibility to the players from 50's, 60's, 70's and 80's for the benefits they now recieve? What kind of burden should be placed on the current financial structure of the labor agreement to recognize the contribution (strikes & missed paychecks and poor/biased medical care while playing) from these earlier generations? 84 when is something going to happen? 85 Why do you want to job? 88 At 50, what will you do in your first 30 days of office that will empact my life that will make a difference "NOW". (2) After having been encouraged to take a early payout and totally frustrated by being turned down several times for disability but medically declared to have degenerative disease ( reason, I have a job) but benefits won't cover cost of living if I stop working to collect. What will you do about this type of situation ? 91 Take care of disabled first, and don't forget anyone who played in the AFL or NFL. Give pentions that players can live on. 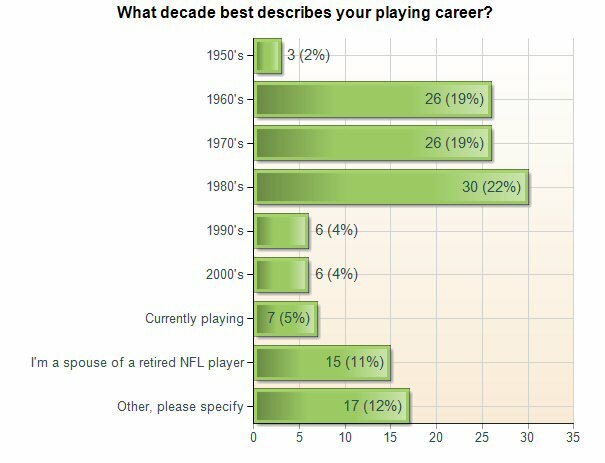 92 If the average age of death for retired players is 55, 52 for lineman why do we have to wait till we're 65 for full retirement benefits? 93 are you honest? are you concerned about active and retired players? 5 He is showing concern and heightened awareness?? 6 Too early to tell but so far a lot of lip service! What question did we not ask that you would like an answer? Please include your answer and or opinion to help DAF serve you. how can we control the input of this survey so that the other bad guys don't ruin the survey validaty. You covered all issues that I can think of at this time. Could the commisoner have more oversee in bring the retired players pension up like the MLB. Why do you think our disability and pension benifits are so poor? Ans. Because the people negotiating for us were trying to take care of the people who they answering to, the active players. All the recent increases have been for the recent retirees, and not shared by us old guys. The NFLPA points to these increases as proof that they are upgrading the retirement system, while doing nothing for us. 1. Do you think the current leadership is overpaid (Gene Upshaw). 2. Do you think the current leadership was dishonest? 3. Do you think professional football has morphed from a sports industry to an entertainment industry? 4. Do you think there will include violence on the part of some retirees if the current benefits are not improved? 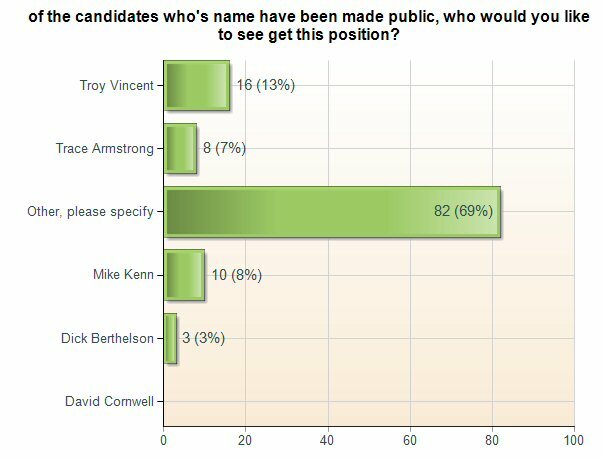 Is Richard Berthelsen a candidate? Why are widows being ask to give up benefits and ask to sign a form each year to clarify if they are married or not? Why does this matter? Did my husband not work for this and was this not set aside to help widows and their families after the passing of the spouse? Is there a way to include the really old, old, guys of the 1940 to 1950 or have they all died off like my husband? What can I do to Help? How can we get a constitution that will give retired players full representation, voice, and vote? DAF is great. Go For IT. I appreciate the time and effort that you have taken. My only concern is that we have a group in Baltimore that is very active and yourself. How about combing the groups for a more solified organization. CAN YOU HELP THE IDIOTS, INCLUDING MYSELF THAT TOOK THEIR PENSION TIED TO SOCIAL SECURITY? How will retirees get a voice in NFLPA matters? We should be represented!!!!! Do Active Players really care about Retired Players. Who represents retired players? How do we get control of our future? We need representation and a voice. 2) provide Blue Cross Blue Shield quality national health insurance upon leaving the game. Benefits for life. 3) Lifetime prescription drug program provided upon leaving the game. 4) Prorate pension benefits toi be representitive of the current CBA. DAF DOING A GOOD JOB!! You did a good job in covering it all. There are not many of the older guys left, and that issue of our pensions should be in the forefront. Each year we are losing more and more of the older players. With all the money involved, including franchise appreciation, is making a concerted and fair effort to help those most in need such a burden, or is it just easier to drag your feet, hoping we'll die out first? Will there ever be decency or fairness or justice for retired players? Unless there's a balance of power established between the NFLPA and the owners, there's no hope. this polling will be fantastic-thank you for initiating this--BUT PLEASE, FOR THE SAKE OF GOD- DON'T LET THIS TURN INTO A "COPYCAT" SITUATION WHERE WE ARE BOMBARDED BY POLLS FROM EVERY OTHER GROUP, like 4th and goal, dave pear, etc...please you guys, work together and keep it to this one poll, for our sake!!! I would ask candidates if retirees will get a voting rep on the NFLPA board, a welcome voice, and what will you do to end the hostility between current and retired players. 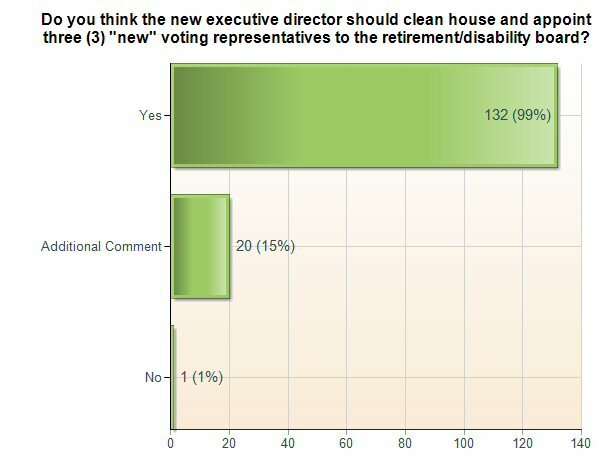 what will you do to improve pensions, even out the years of vesting, and will you get rid of the current 3 voting members of the retirement board, and let retiree's select the 3 replacements? you did a good job with the questions- just please coordinate with other groups so we do not now get pols from everybody. You didn't list any NFLPA Ex. Director candidates other than those currently affiliated with the NFLPA. I'd rather have a true labor leader in that position than someone with NFL experience. I believe the NFL and NFLPA should provide comprehensive transition programs for ex-ballplayers. These should be based on the psychology of retirement and career preparation. I don't know how that could be put into a question. Considering the high mortality rate amoung nfl retiree's, how soon can we see a significant improvement in the pension plan. How can we inform current players, who have the power to choose a new commissioner? also, please don't everybody come out with polls, our email boxes ae too overloaded from you guys!!! Who is best qualified to serve as executive director? If we were granted apostion on the board to represent retire palyers who would elect and would he be elected by the vote of only the retired players. Is the Retired NFLPA be a separate entity form the Active NFLPA? Who knows and can speak with any of the 32 Player Reps who will be electing the new Executive Director? When are there going to be changes so people like my husband can have some dignity? 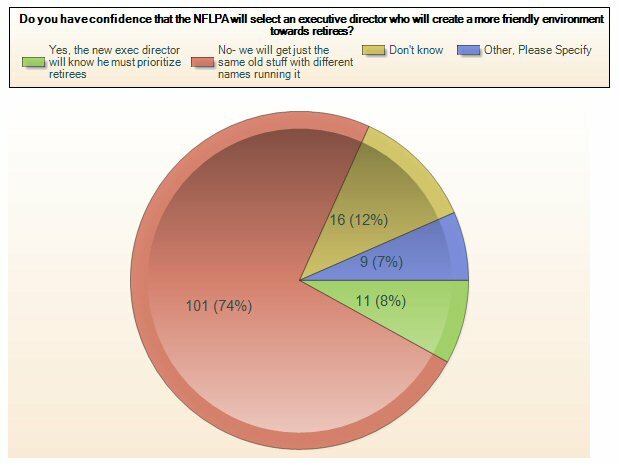 Are retired NFL players receiving enough unbiased information about the state of the NFPLA and the upcoming Exec. Dir. appointment? Why can't a retired player have a vote on all issues as the current players have? As a new executive, would you shut the wife out from NFLPA meetings where she is the proxy and represents her husband - the injured/dibilitated player? Why doesn't the NFL hire more former players? When will you care for the players that are disabled? does your family take care of your sick and elderly family members? do you make sure your parents/grandparents/uncles/aunts live life with DIGNITY, as Brent BOYD so aptly fights for on our behalf? will you have open friendly dialogue with Brent Boyd - honor his fight, and the other advocates- pay tribute to their heroic efforts for your union members? Or will you continue with punishment and ostracizing those who have been doing what your job SHOULD have been doing all this time? Do NFL retirees have any legitimate alternatives to having the NFLPA represent us? I'm afraid that our only leveredge with the NFL is through the NFLPA, and unfortunately, Ed Garvey taught Gene Upshaw how to look out for his own interests, and the culture of the current NFLPA executive staff is firmly entrenched in the continued exploitation of retired players so that more money is available for their own selfish and greedy motives. do the current players know exactly what happened and how they receive the benefits they receive currently? Having gone through 2 strikes and losing thousands of dollars I hope they have some knowledge of what happened in the past. Do you try to "handicap" the income of a 60's player to "inflate" his "today earnings" to level the playing field?. Am I getting same % of league money now as comparable career now??? I was a running back 12 years....What does/will a 12 year running back (1990-2002) get when he becomes eligible? I"m presently going through the steps of applying for line of duty disability and its now going on 9 months for an approval or denial. that's absurd under any circumstance! 1) Why are the MLB and NBA retirement benefits so much better than the NFL? 2) During my 17 year career - 1978 to 1994 - there was NEVER a direct, full membership vote, on ANY issue or decision... Why? Will the tradition continue with new - post Garvey / Upshaw - leadership? Will former players ever have a vote? My main concern is how our pension can be increased. Right now our benefits are pathetic compared to what we do to our bodies. Where is all the money during Gene Upshaw's ten year? Why do all other pro sports start getting retirement benefits as soon as they retire?